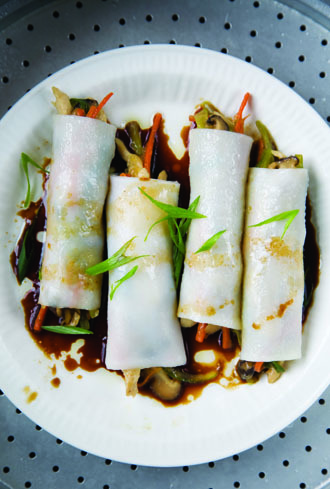 Impress friends and family this holiday season with this delicious chicken and vegetable rice roll recipe from Andrea Nguyen's book Asian Dumplings. Chinese cooks use rice sheets as wrappers for not only shrimp and beef, but also tasty stir-fries like this one. The chicken and vegetable mixture here could be used as a filling for deep-fried spring rolls, but it is also wonderful in this delicate treatment: encased in rice sheets and steamed. The chicken and vegetables are cut into matchsticks to complement the shape of the roll. To cut the chicken, freeze it first for 5 to 10 minutes, slice it, and then stack the slices and slice again into thick matchsticks. Pork tenderloin or beef flank can be substituted for the chicken. For a vegetarian version, replace the chicken with 2/3 cup packed shredded bamboo shoots (boil for 1 minute first to eliminate the tinny flavor) and decrease the cornstarch to 2 teaspoons. Quick Tip: If you don’t have the time to make your own rice sheets you can find them at Asian Markets, Andrea advises. Look for them in plastic bags with red lettering, or go here to read Andrea’s guide on how to shop for rice paper sheets. 1. To make the filling, in a bowl, combine the salt, the 1 teaspoon cornstarch, the 2 teaspoons water, and 1 ½ teaspoons of the oil. Stir to dissolve the cornstarch. Add the chicken and stir to coat well. Set aside to marinate for 15 minutes, or cover and refrigerate for several hours, returning it to room temperature before cooking. 2. Combine the remaining 1 tablespoon cornstarch, remaining 2 tablespoons water, the soy sauce, oyster sauce, sugar, and white pepper. Stir to dissolve the sugar. Set the seasonings aside. 3. Heat 2 teaspoons of the oil in a medium skillet over high heat and add the chicken. Cook, stirring constantly, for about 45 seconds, or until the chicken has mostly lost its raw color. Transfer to plate. Lower the heat to medium high, add the remaining 2 teaspoons of oil and then the mushrooms, carrot, and celery. Cook, stirring frequently, for about 2 minutes, until the vegetables are tender-crisp. Add the scallion, stir, and then return the chicken to the skillet. Combine well, then add the seasonings. Cook for about 30 seconds, stirring, or until the mixture has thickened. Transfer to a plate, spreading it out, and set aside to cool completely before using. Or, cover and refrigerate overnight, returning the filling to room temperature before using it. You should have 1 heaping cup. 4. Lightly oil a plate. to assemble the rolls, cut a rice sheet into 4 (3 ½ inch) squares. Center 1 ½ tablespoons of filling along the midline of one of the squares. Bring up the lower edge of the rice sheet to partially cover the filling and roll to close. There should be about a ½ inch overlap of rice sheet when you are done. Place the finished roll on the oiled plate, seam side up, and repeat with the other swaures before moving on to the next rice sheet. Oil a new plate and use after you have filled one up. It is fine for the rolls to touch. When making the rolls in advance, lightly coat them with oil to prevent drying, cover with plastic wrap. And set aside fro up to 3 hours. They can be refrigerated for up to 8 hours and returned to room temperature before steaming. 5. Before serving, put the plates of rolls in steamer trays and steam over boiling water for 3 to 4 minutes, until the rolls are soft and heated through. Remove the plate of rolls from the steamer tray or keep them in the trays and bring to the table. Keep the rolls whole or cut them into thirds with a knife or scissors. Liberally pour the sweet soy sauce over the rolls, letting it pool in the plates, then garnish with the scallion. Serve immediately with the chile garlic sauce. Reprinted with permission from Asian Dumplings: Mastering Gyoza, Spring Rolls, Samosas, and More by Andrea Nguyen, copyright © 2009. Published by Ten Speed Press, a division of Random House, Inc.
Andrea Nguyen’s Asian Dumplings is a treasure for dumpling lovers and novices alike. Over 75 recipes cover the broad spectrum of what we know today as the “Asian dumpling”: from spicy potato samosas, chicken and vegetable rice rolls, shrimp rice noodle rolls and even red bean buns. Andrea’s Asian Dumplings goes beyond the mere instructional. With an introduction to every recipe in her book Andrea educates her readers on the cultural significance of each dish, becoming your personal dumpling guru. Andrea is a food writer and cooking teacher living in Santa Cruz, California. Her first book, Into the Vietnamese Kitchen was nominated for three James Beard and IACP cookbook awards. For cooking tips and more information about Andrea and her books, visit: http://www.vietworldkitchen.com and asiandumplingtips.com.